The only company that offers customers the option of adding or moving jets. 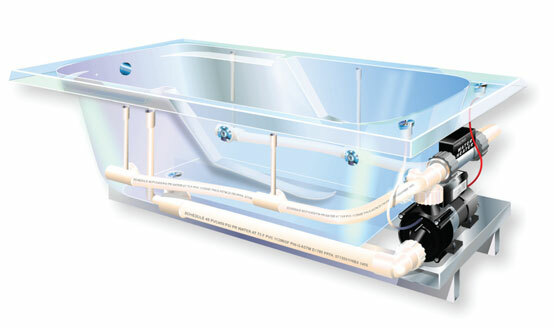 One interchangeable pulsating jet supplied witheach bath. Acrylic bath tub shell has a lifetime warranty select from designer colors including hard to find marble and granite selections. Custom pump locations available for all models. Place the pump where you need it for accessibility. 2HP and #HP pumps are standard and carry a LifeTime Warranty. The only manufacturer that provides a steel reinforced floor and motor mounting platform. Automatic air valve is installed at each jet which maximizes jet pressure. Rigid PVC pipe for all waterlines insures pipes drain 100% which insures a clean, sanitary system. No sagging pipes to trap water when the bath is emptied. Certified to U.L. and ANSA standards. Single air control supplies air to all the jets and produces irregular jet pressure. No option for moving or adding extra jets. NO pulsating jets supplied. No custom pump locations, with smaller pumps, and limited warranty. Tub floor is supported with wood or plastic which will warp and flex.This leads to noise, cracks and leaks. 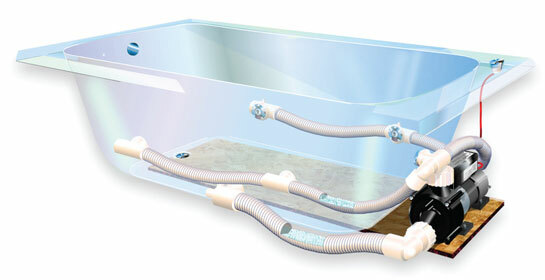 Flexible vinyl lines sag and trap water when the bath is emptied. Vinyl lines are not code compliant and are clamped on not glued to each jet which again is not code compliant and can result in leaks.